Really, a beer cocktail? Beer can have a few modifications done to it as well. We know there are a pile of different beers out there, but sometimes your guests just aren’t in the mood for a beer by itself. Over the course of your serving, or drinking, career you have probably encountered some odd combinations. I know on a recent trip to Germany, I was sitting on a patio and noticed a sandwich board outlining a few different beverage options. A Radler, Diesel and an Alster. These three drinks take a light beer and mix it half with a pop. Gross or tasty? The traditional Radler arose in the Netherlands along a popular cycling route. One day a group of cyclists arrived at a little pub for a refreshing beverage, but needed something with a bit more sweetness to it. The proprietor mixed a bit of juice in with the light beer he had kicking around and the weary riders lapped it up. The radler was born, and now microbreweries pitch grapefruit radlers as the perfect summer picnic beer. Back to that German trip, the Radler they were serving was not using any kind of fancy juice. The Radler they served to tables was half beer, and have orange soda. The Diesel, was a beer cocktail consisting of a light beer and cola. Finally the Alster was created with beer and 7up or sprite. 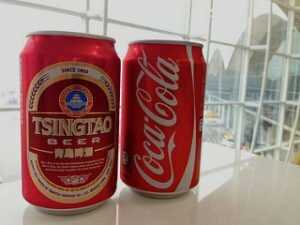 The locals swore by it as a tasty summer beverage… I am more of a beer purist though and couldn’t imagine wrecking even a nasty beer with a sweet soda. I’ll save my spirit and soda mix for a highball. Some people like to shake a bit of salt in their beer to make the beverage a little more savoury. Others want a side of sour mix (margarita mix) as a side to offset the flavour of the beer. We have some more traditional beer cocktails are outlined below. The Black and Tan is a very popular beer drink. This only beer cocktail is firstly a layer of pale ale, then a stout (Guinness) which sets at the top. 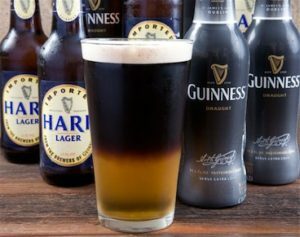 The reason they call it a black and tan, is because the dark beer and the pale beer are layer in the glass. It’s like a Bloody Mary, but not quite. It’s a Red Beer! Start with tomato juice and top it off with your favourite beer. It’s not just simple, this beer cocktail is simply fabulous! Add a pinch of salt if you’d like and serve with a smile – Enjoy! Start with a pint glass and add 4 oz of Tomato Juice. Fill the rest of your pint with Beer and a pinch of Salt to your personal taste. Note that some establishments will just serve the tomato on the side in a sidecar. Guests may also ask for a side of Clamato instead of the tomato to make that beer cocktail. The Clamato of course being more of a Canadian thing, and we Canadians do drink a lot of beer.